So, I have a VERY cheap, old Ryobi that only allows me to rip up to like 9” at a time. I really want something that can do 24”. 10” blades seem to be pretty standard, is that big enough for 90% of things? I can’t spend a ton, maybe $300, but wondering if that will get me anything used? Features—-What should I be looking for/staying away from? Which brands to look for? Which brands to stay away from? I’m not looking to go into the woodworking business, but am starting to tinker around with things for our house, also, I do all my own construction type projects at home. Any advise would be greatly appreciated. Also, live in Madison, WI and if you see anything on Craigslist Madison, or within like 75 miles that would be a great saw to have, I would appreciate any leads you could share. Thank you very much in advance for your post/help! I looked at one of those once, a lot of plastic and very light weight. If looking used, a Delta contractors saw would be good, some of the older Craftsman saws. You may even find a decent used cabinet saw or hybrid. A Bosch I think the model number is BC 4000 are nice portable saws. KnotScott will probably reply and he is the tablesaw guy on the site. Look for a used Craftsman 113 series saw. They are good saws except for the fence, you can probably find one in decent shape for $150, leaving you with enough money to upgrade the fence. What questions would I ask of the seller? LOL, sorry, msg. was reading the post from the bottom up and just realized you also posted a 113 that is closer to my area. Thanks. What should I be looking for? Is the 1 HP motor enough? Also, how do I know how good the fence is? The saw I posted for you looks all intact, has splitter, guard, miter gauge. The fence should lock straight, if it doesn’t there are some adjustments you can make. The fence can be updated with a Delta T3 or similar and still be in your budget. As for the motor, plenty of power for what you are using it for. To go to 3hp it would mean a jump to a cabinet saw. I am using a Delta contractors saw and it does fine. It the future I will be upgrading to a cabinet saw. I had a saw similar to the the one mrg posted, except it was one of the flexdrive models. The fence on those has much to be desired. I finally upgraded to the T3 fence and it made a HUGE difference. As long as you use thin kerf blades and watch your feed rate, the 1hp will do most of what you ask of it. The new saw you linked to from Sears is a pretty humble saw. I’d pass on that one for sure. The used saw mrg linked to is on the right track. Looks to be in good shape for $125. The fences on those are indeed excellent candidates for an upgrade, but at least the saw has potential. Something like a Delta T3 would be logical replacement. Enough power with a good 3/32” thin kerf blade. 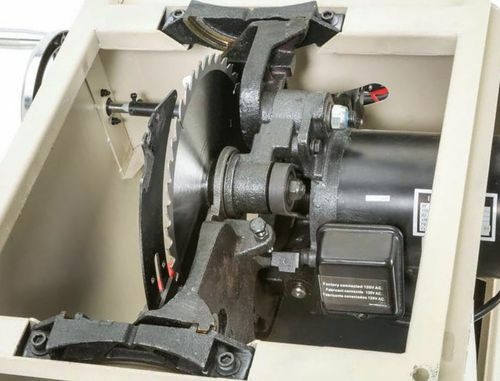 The used one you linked to for $200 is a direct drive saw….not ideal. OK, I think I’m going to check on the one MRG linked to in Oregon for $125. What is a trunnion and what is a pre-riving knife? Also, is it easy to install the Delta t3? What advantage is this over the stock fence? 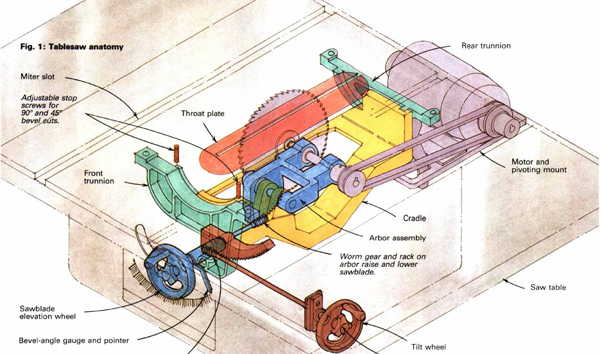 The trunnions are a major part of the underpinnings that hold the blade arbor and allow it to raise and tilt. Cabinet mounted trunnions are mounted to the cabinet, and are easier to align, while table mounted trunnions hang from the underside of the table and require the whole system to be. 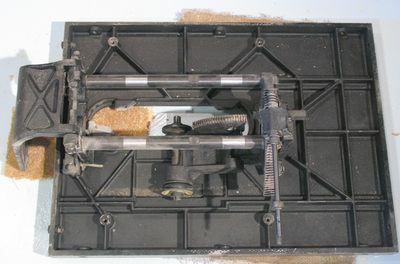 Cabinet mounted trunnions were typically found on industrial cabinet saws, and have a history of being more robust just due to the sheer duty ratings of the saws they were on. 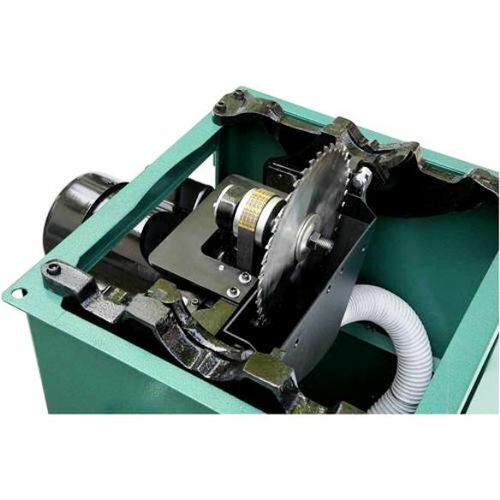 The lines have blurred a lot in recent years, with several hybrid saws now offering cabinet mounted trunnions that are similar in duty rating to the traditional table mounted trunnions of the old contractor saws. 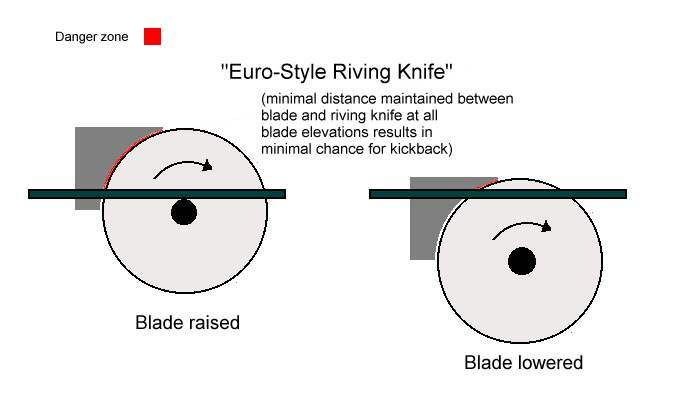 A riving knife is a type of splitter that raises, lowers, and tilts with the blade, vs a traditional splitter that is either fixed in place, or only tilts with the blade. Both accomplish the same task of preventing the wood from pinching against the back of the blade causing kick back. 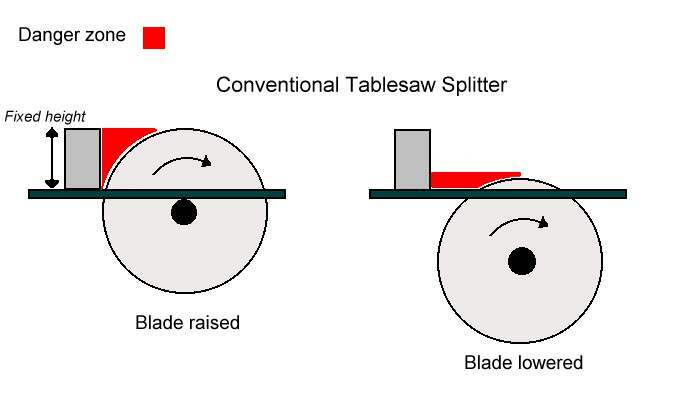 The riving knife generally sits in closer proximity to the blade, and is preferable to a standard splitter, though IMO lack of a riving knife is not sufficient reason to pass up an otherwise nice saw at the right price. The term “pre-riving knife” simply means the saw was made before riving knives became popular in 2009. (UPDATE, this is what the guy said when I asked him about the condition of the $125 113 series and he said this, “I do cabinet work, metal fab, machine repair and lots of similar stuff as a hobby. I picked this up cheap cuz it needed a motor and sprucing up. I gave it the once-over and the money I come away with, finances those hobbies. Saves the saw from being scrapped and returns it to being a nice working tool that somebody can use. Seems like I should grab this while I can???? The stock Emerson steel fence on those old 113 saws was pretty finnicky…inconsistent and not easy to get parallel repeatably. The T3 is much more user friendly, easy to use, easy to get parallel every time, more rugged, etc. Installation may require drilling some holes, but cast iron drills pretty easily…many folks have done this upgrade, so its doable. Honestly I would not advise a newbie to buy a saw and then to change the fence on it unless it was a simple bolt on job. I didn’t want to go through that myself even after quite a few years of messing with machinery. I suggest that he slows down a bit, does some research and then decided if he needs or should get a large cast iron top saw, because that may not be what is best for him. I feel your pain. I have been having the exact same issue. I have a Ryobi BTS20 which is a good basic saw for a contractor, but the lack of height locking wreaks havoc on dadoes. I have been to Depot and Lowes debating the difference between the Rigid and Delta. Out and about looking at saws listed on Craigslist. The only cheaper option I liked was the Rigid because of the lifetime service agreement. However, a ton of reviewers had issues with it, just like the Delta comments and no one seems to like Craftsman any longer. I am going to go with the Grizzly G0771Z for $895 when my tax return comes in. It is a few hundred more than the Rigid and Delta from the box stores, but has a stronger record of reviews. 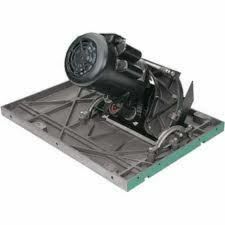 It is $200 cheaper than the next step up, which has two upgrades; a better fence and an over guard dust outlet/hose that comes down to the main 4” port. So my debate is about the fence – is the upgrade worth $#200 more. These two hybrids seem the only way to get in without having to jump up to cabinet saws from Jet and SawStop, Let us know what you do. I intend to post back to lumberjocks with my impression when I get the new saw. I like the pricing of the Craftsman and wondering really how necessary the fence change will be anyway?? The price seems right, no??? The fence change is not that difficult. You don’t have to change the fence but the original fence is inaccurate and if you do get it squared up there is not repeatability. I had a 113 when I finally upgraded the fence it actually made a very good saw out of it.